Several months ago, my best friend landed his dream job in Ithaca. Within the day, he was looking for places to live. I being his roommate, and trying to be as discreet as possible given my borderline-unhealthy interest in Ithaca real estate, was more than happy to listen in and offer advice. One of the places he checked out was The Boiceville Cottages (I’ve always assumed this is pronounced like “Boy-ss”, like the Boyce Thompson Institute on Cornell’s campus). 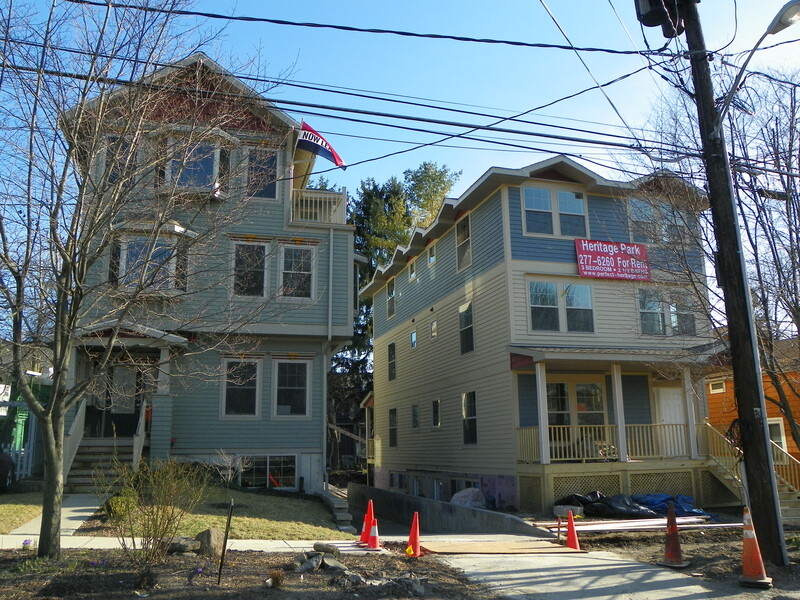 As multi-unit housing goes, they’re quite unusual. 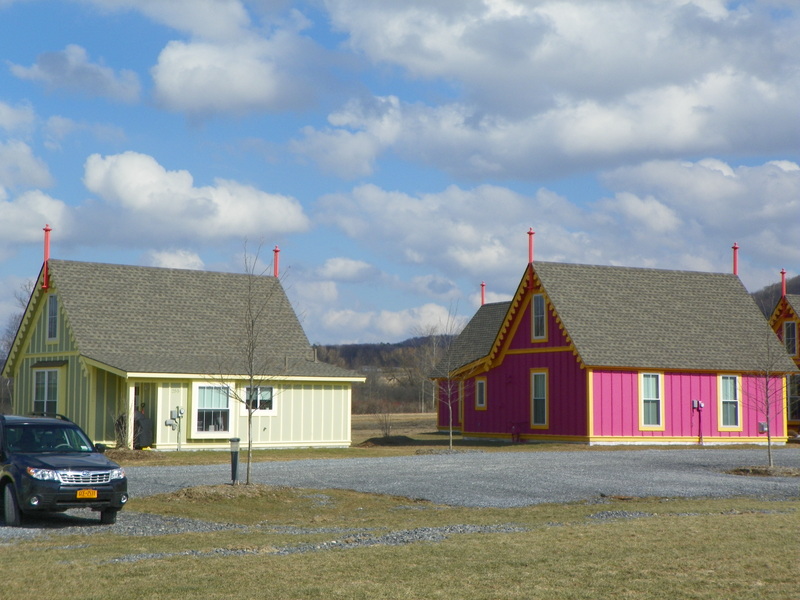 In general, housing is set up in single-unit cottages, clustered in groups of three. 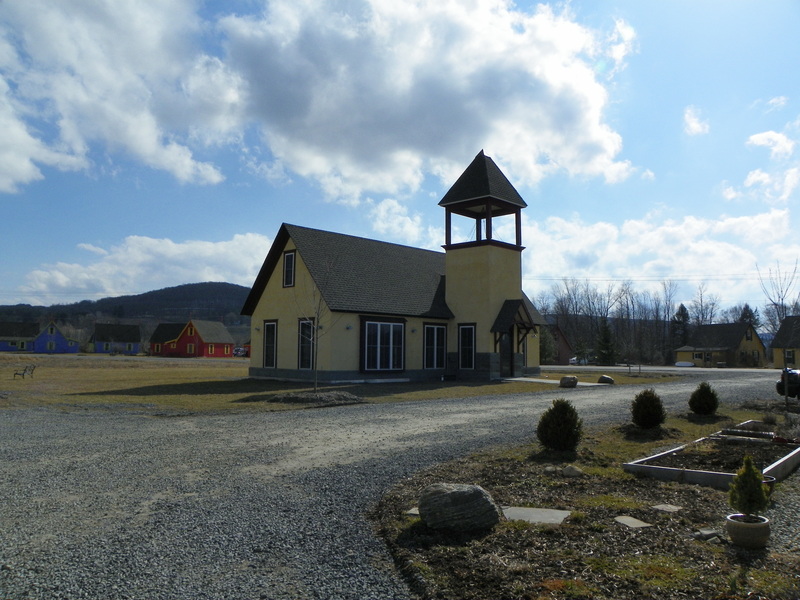 More recently, a few three-unit buildings, and a church-like meeting house have been erected. Perhaps the most obvious details are the colors. It’s like someone looked at a bright cheery children’s storybook and went to town. Apparently, such tales were at least part of the inpsiration for their appearance, with the intricate eaves and vivid paint-jobs. 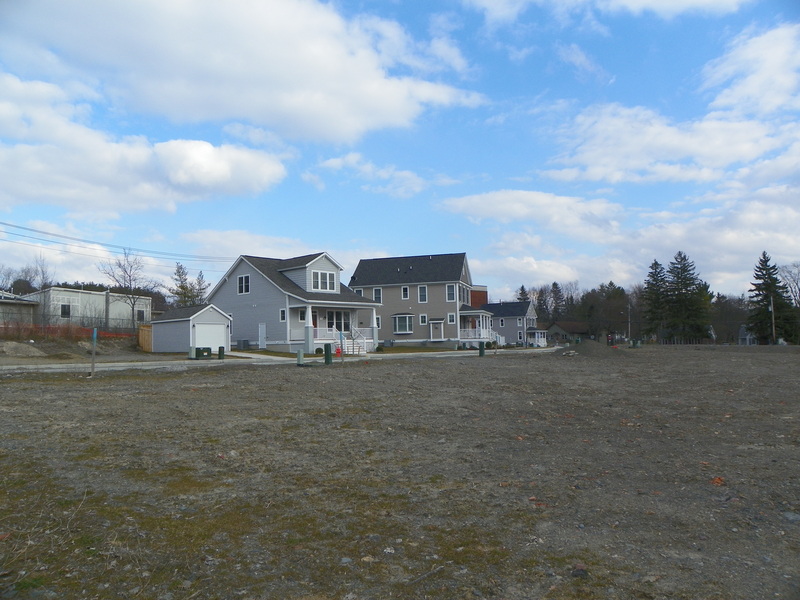 The project is a little out of the way, about a mile south of the Caroline town hall and Route 79. So it took me a little while to swing out for a visit, and see them firsthand (my friend settled in Eastern Heights. Boo). This development further caught my attention because of the expansion underway. 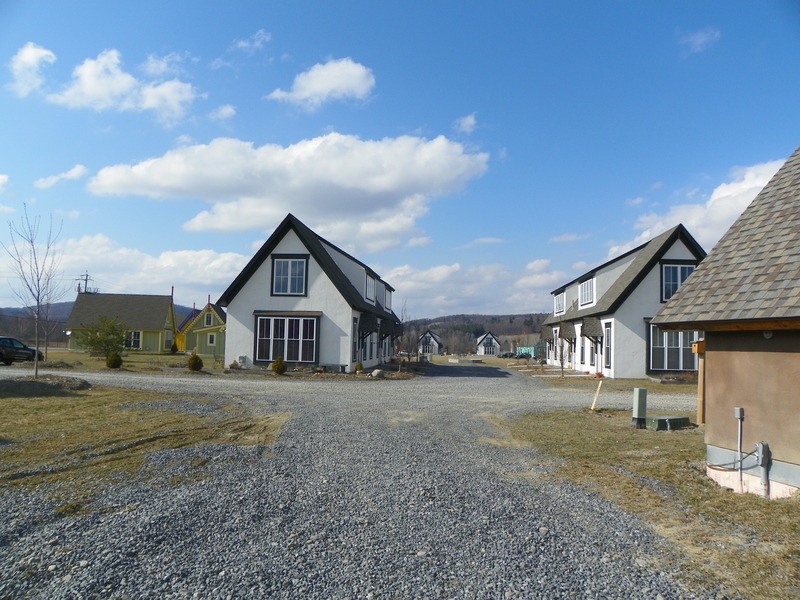 The Boiceville Cottages development was first initiated in 1996, and from what I can tell, it took about ten years to build the first 24 units. Around 2007, a second phase was initiated, with 36 units. 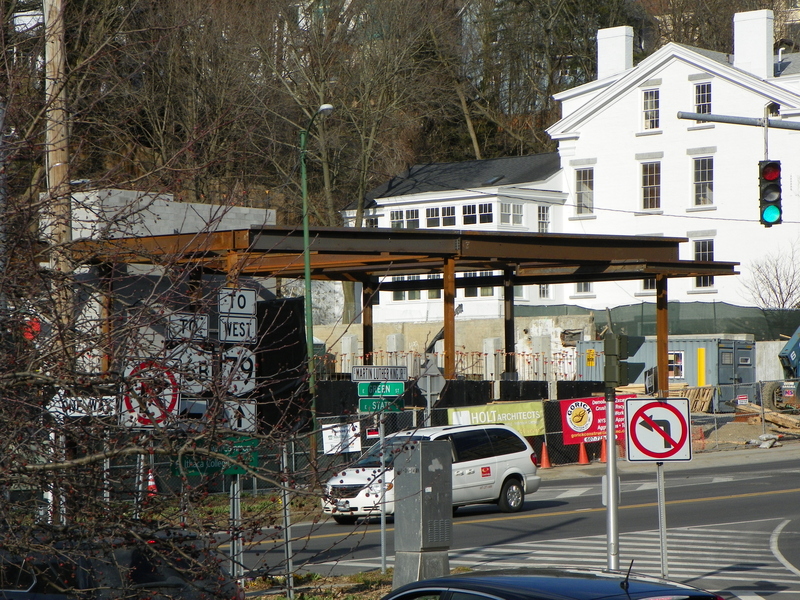 As of last year, this phase is complete (so, they definitely picked up the pace on construction…). 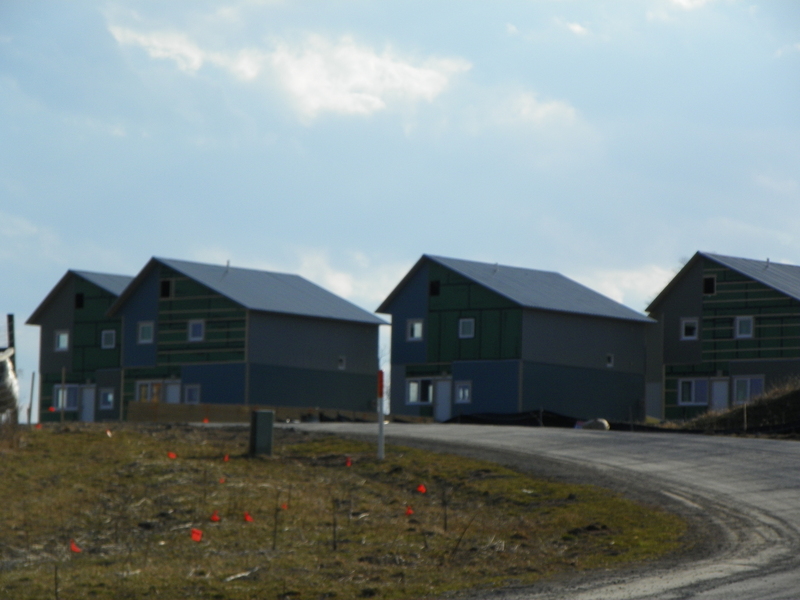 Recently, they were granted approval for the construction of 75 more units, doubling the size of the complex. When I finally made it out that way a few weeks ago, I was going around taking photos, when an older gentleman in a pickup stopped and asked if I could be helped. Generally, I’m extremely cautious when I go on photo tours – on previous occasions, both Ithaca and elsewhere, I’ve been threatened with the law and with violence, so I regard every interaction where I have a camera in my hands with extreme prudence. The gentleman turned out to be the builder/developer, Bruno Schickel. About a month earlier, I had asked if there were any renderings or site plans online (the answer at the time was “only what’s on the website”; the link above is a site plan from a town review of the project). So I wasn’t a complete stranger. We chatted politely for a couple minutes, I told him how I thought he had a unique and creative development. He invited me to check out a display unit (which due to a long to-do list, I politely declined). All in all, I’m glad I did not get chased off the property, and my thanks to Mr. Schickel for tolerating this random guy taking photos of his property. I’ll admit, took a little longer than expected. But being a first-time first author on a just-submitted scientific paper for peer review…well, that took precedence. Now that I’ve finally crossed that off my professional bucket list, I can put up the last few photos. 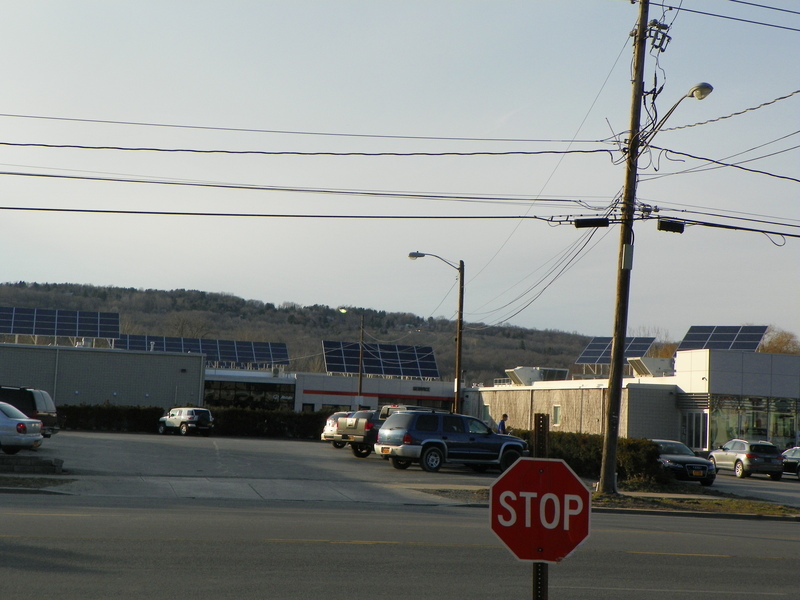 I have variations of project photos, and Ithaca photos in general, which will show up as other entries are written in due course. 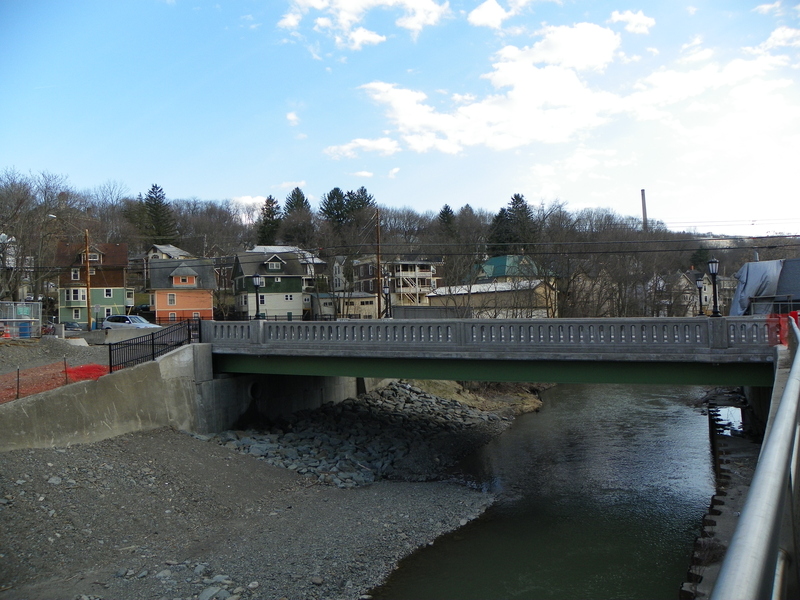 Hello new and not-completely-sad looking Clinton Street bridge. The lightposts and balustrade are nice touches. Personally, I wish the steel was something other than Grandma’s fridge green. 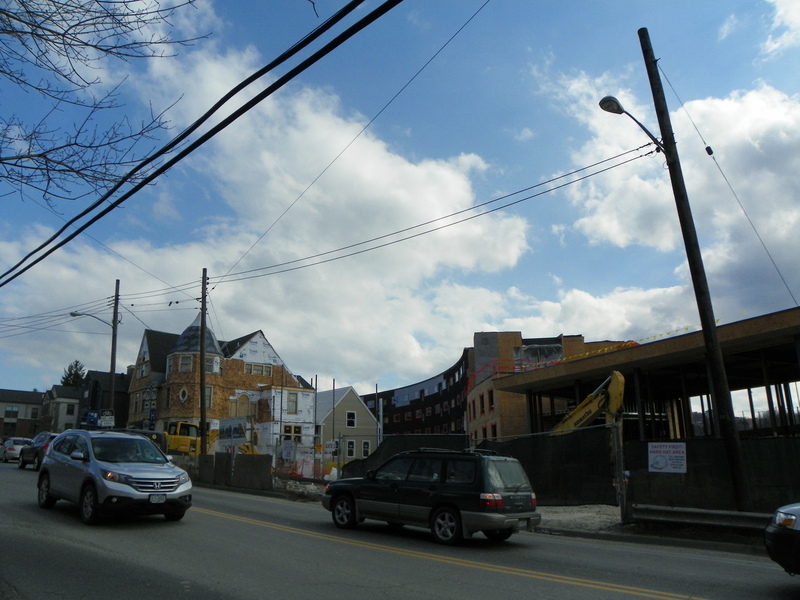 I was not completely sure where local uber-capitalist Jason Fane was planning his new 3-building, 36-unit project. 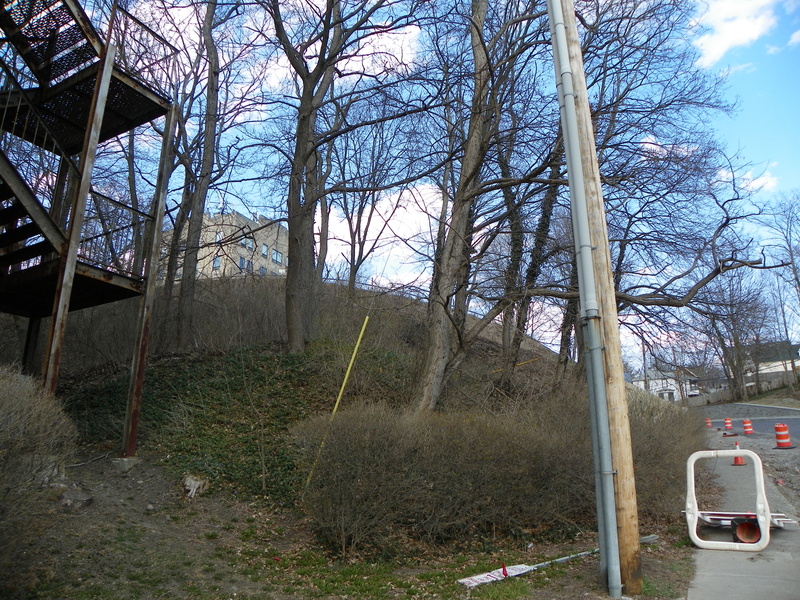 But I figured this hilly area next to the City View property and the IPD was a likely guess. Two things. One, noting that it is not Harold Square, but Harold’s Square. Well noted. 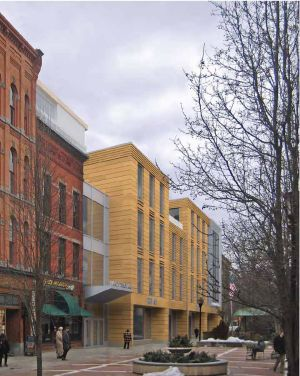 Two, as shown by the Ithaca Times, the proposed design has been revised. And in the opinion of one armchair architecture critic, it has gone from meh to hideous. For reference, the old renderings. Now, I thought the original design for the Commons side was fairly okay. The revised proposal…it looks grim, the “modern” steel sections are like tumors growing out of a rather cold and dour facade. The exposed truss on the tower portion is gone, but now there are narrow misaligned slit windows. Reminiscent of Cascadilla Hall. Or a prison. 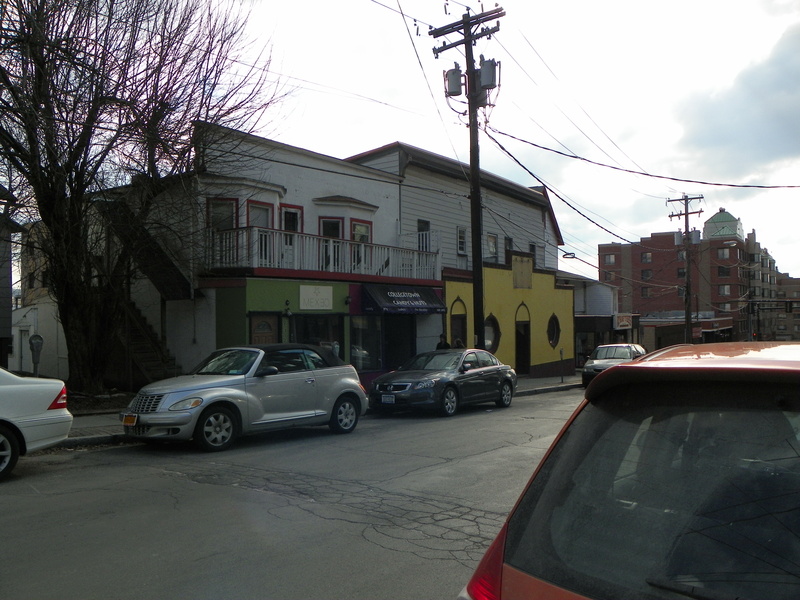 Or most closely, the rather awful 499 South Warren Street in Syracuse. 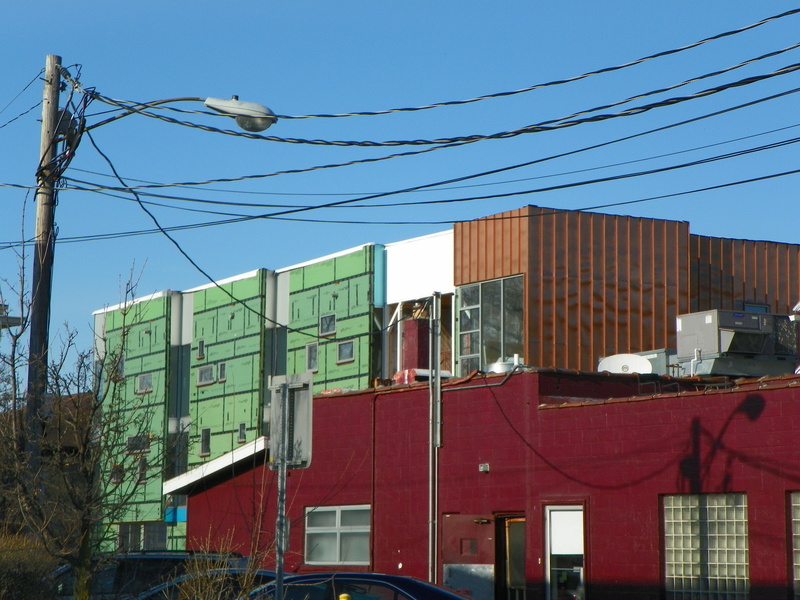 Don’t get me wrong, I like what the project provides – mixed-use, high-density, downtown-friendly. But unless the materials are mind-blowing, I fear this thing is going to age terribly. 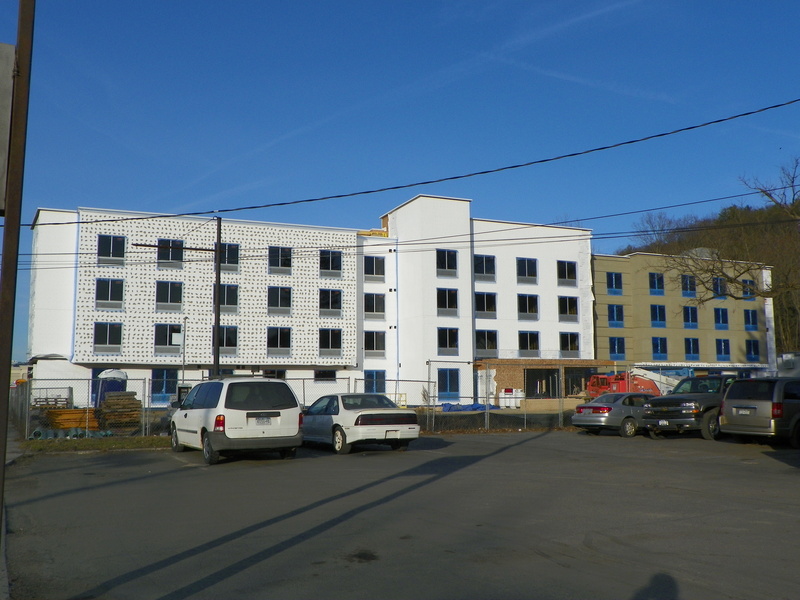 Facade work is just beginning on the new 106-room Fairfield Inn down in big box land. 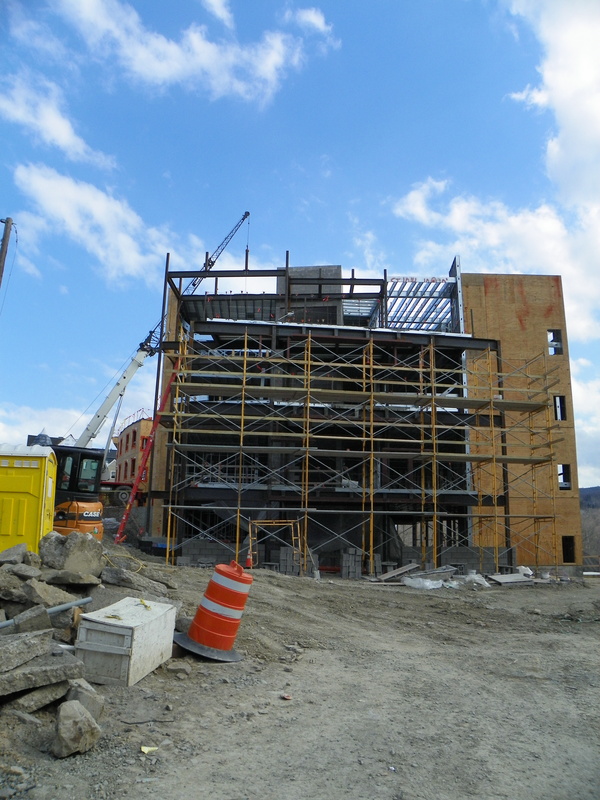 The project experienced a bit of a hiccup back in January when two construction workers were injured at the site, falling four stories through collapsing scaffolding above an elevator shaft. 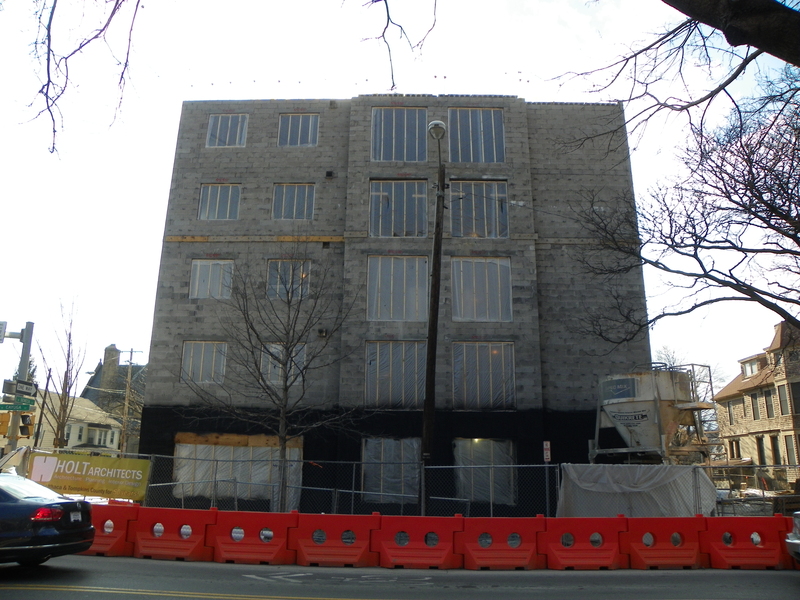 Occupancy is slated for mid-fall 2013. 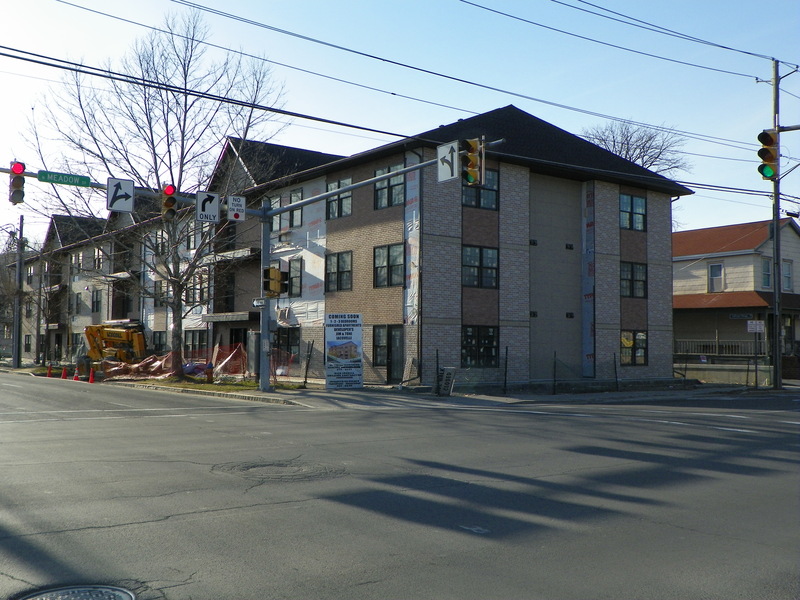 Site prep is under way for the new 18,000 sq ft Planned Parenthood building on the 600 block of West Seneca Street. It would be unfair to label this a demolition. 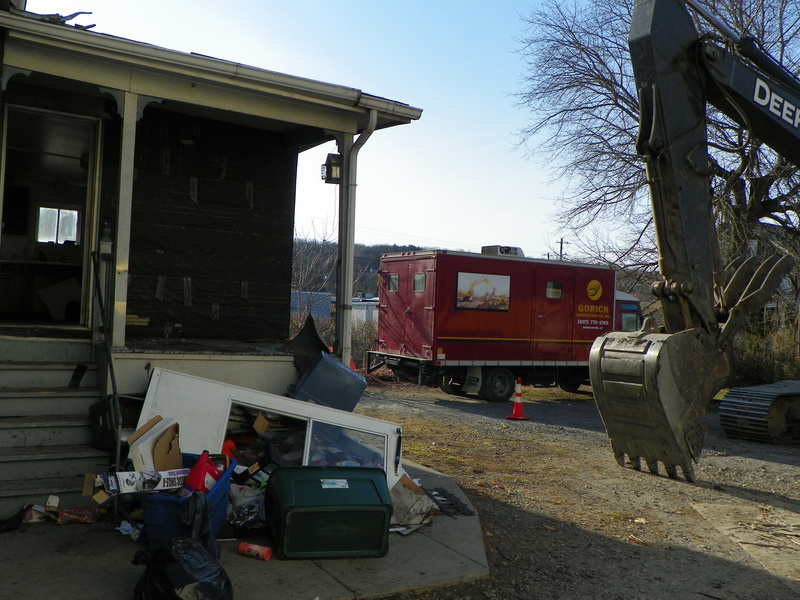 If anything, it looks like a careful deconstruction is underway for the run-down homes currently on the property, salvaging what can be reused before the rest of the structure is torn down. A maneuver like that deserves a big thumbs up. 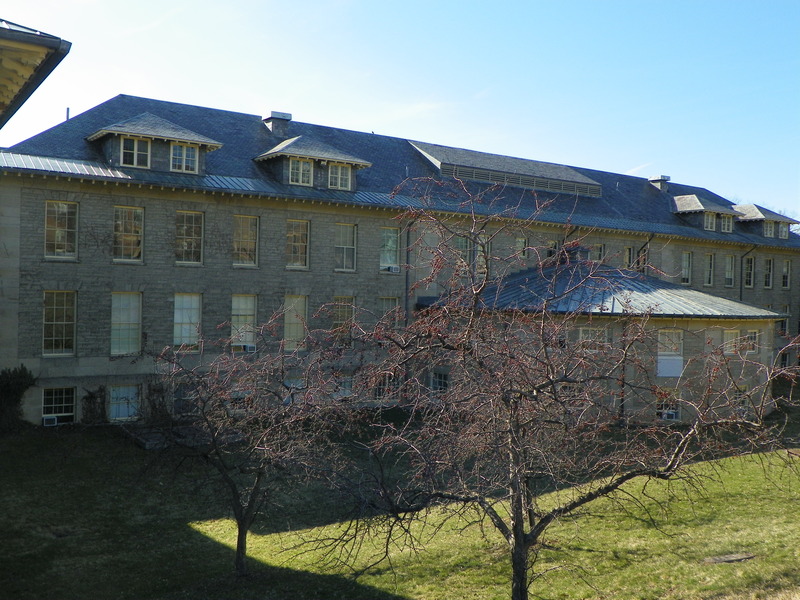 The project will begin construction during the summer, with completion around late summer 2014. 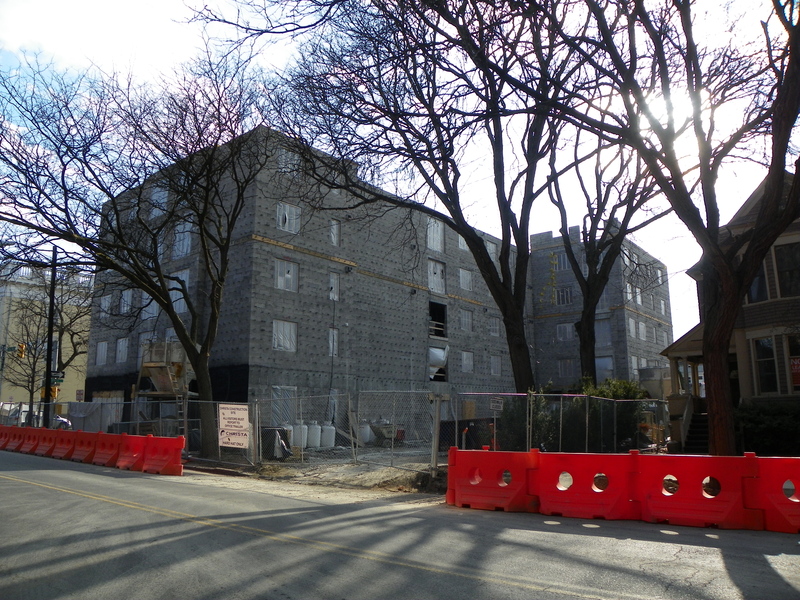 5 of the 6 floors have been built for Breckinridge Place; rather curiously, only a couple bits of masonry and steel are up to where the sixth floor will be poured. 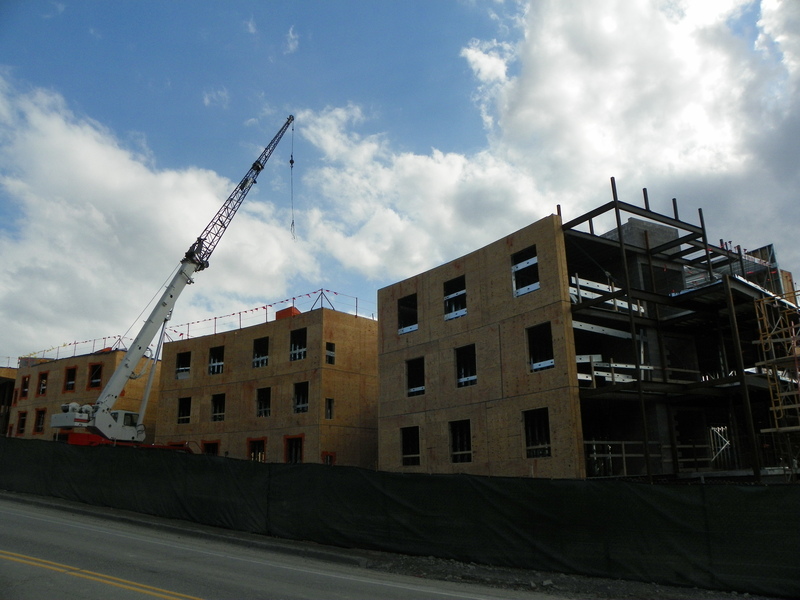 The 50-unit project should be completed and ready for rentals by this fall. This photo will very quickly become outdated. Firstly because of the Commons reconstruction, which I’ll cover at another time. Secondly, the Harold’s Square project. 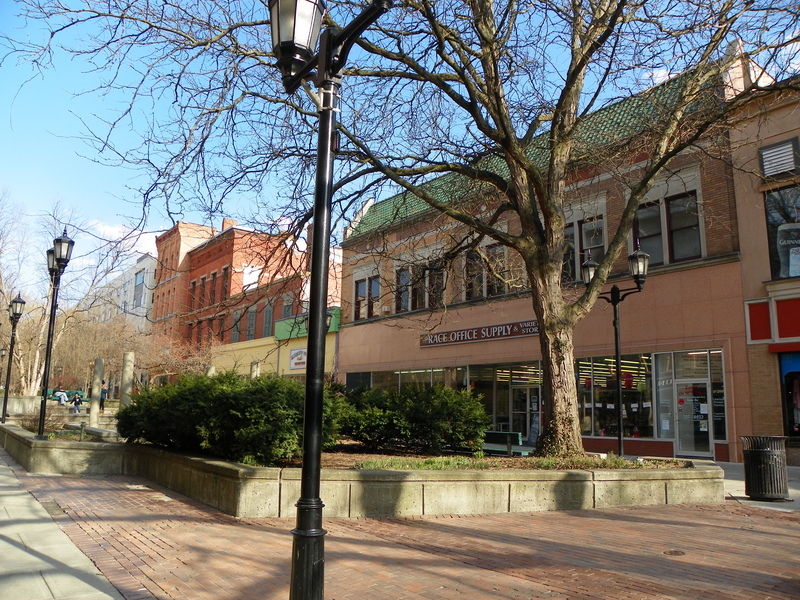 The 10-story, 140-building will refurbish the Sage Block and the Miller Buildings (the orange brick structure left of center), while the three buildings at center will be demolished. The mixed-use project will have retail on the bottom, office space on the first few floors, and apartments on the upper six floors (estimates range from 36 to 70). 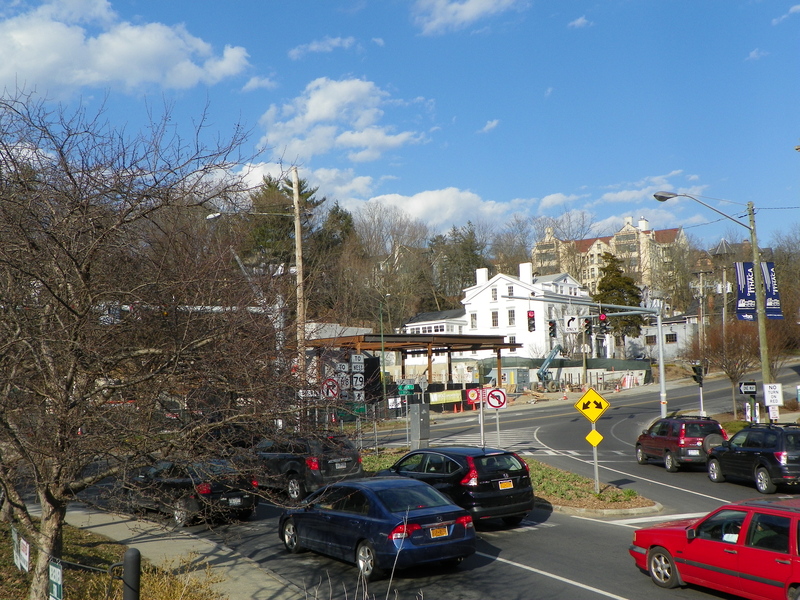 Although the project still needs some zoning variances, if all goes well, construction could start by the end of the year, with completion around mid-2015. Another soon to be outdated image. 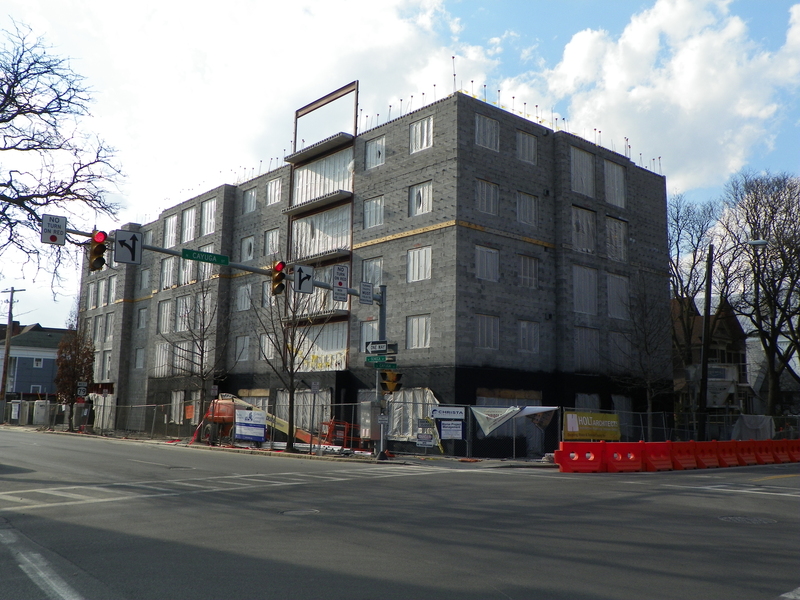 The “Lofts at Cayuga Green” will add 39 units on four 15′ floors. 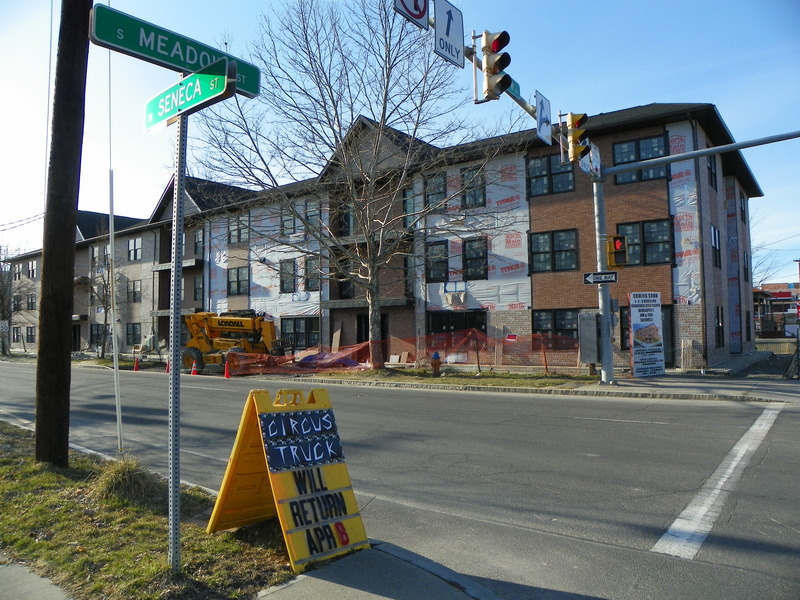 In a recent interview, the director of planning and development expressed concern whether the project would start this year, but given that funding is in place and the developer’s tax credits will expire otherwise, my guess is now or never. Now, another project that is underway. Seneca Way will add 38 apartments and ground-floor office space. 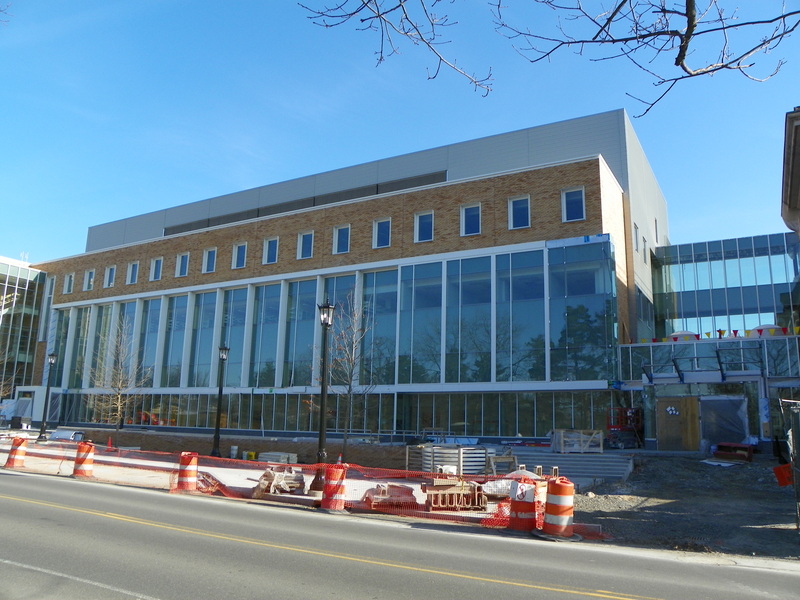 The five-story building is expected to be opened in Spring 2014. Meanwhile, the Argos Inn next door should finally be open for this business. Hotel work, approved and set to begin. At top, the site for the new Marriott. 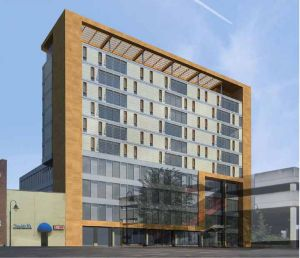 With tax abatement approved, construction will start by summer, with an 18-month buildout for the 10-story, 159-room hotel. 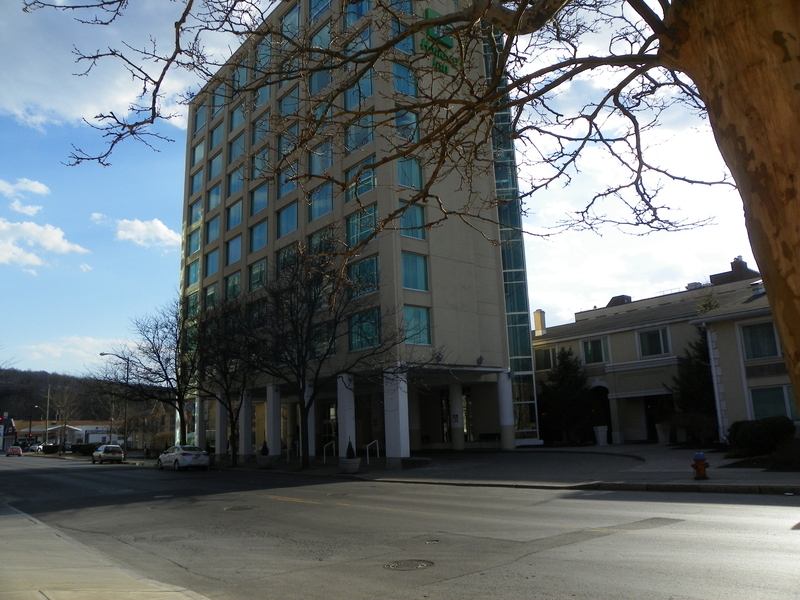 The Holiday Inn will also begin its reconstruction this year, tearing down the low-rise portions for a 9-story tower and a convention center (and a net increase of 13 rooms). 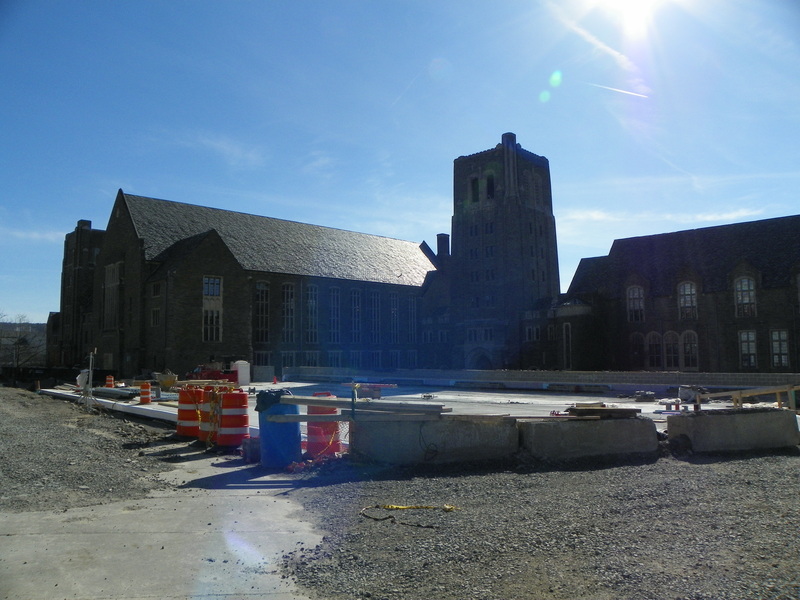 The low-rise portions are slated to close in November, and while renovation of the older tower will be done by May 2014, the new tower and convention facility will probably require another year before they are completed. All other photos will be uploaded in the final entry. So, for the record – driving around town trying to get pictures of all the projects outside downtown was a royal pain in the arse. Not that I don’t like to have lots on my itinerary, but more than once, my aching feet and my gas tank were making me regret the jaunt about town. 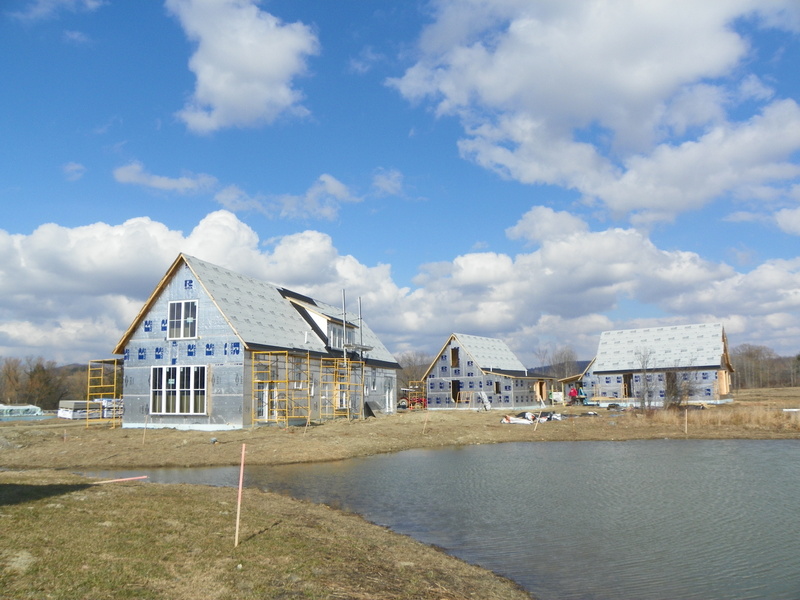 A couple sites I passed without taking photos; these were projects not yet underway, such as the Thurston Avenue project, the Stone Quarry Apartments, and CU Townhomes project on Harwick Drive. I will generally not take project photos when I’m catching up with old friends; it’s a respect thing, and I also like to pretend that I’m a normal human being. I’ll be doing a much longer post about this eventually, but the first new homes are underway for the Boiceville Cottages‘s 75-unit expansion out in Caroline. 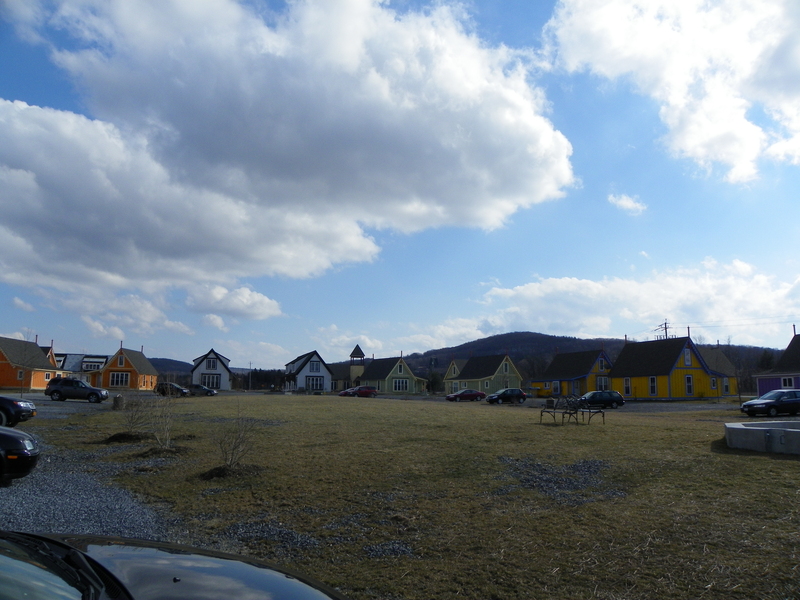 Currently, the site has about sixty units, 16 clusters of cottages and 4 3-unit buildings. 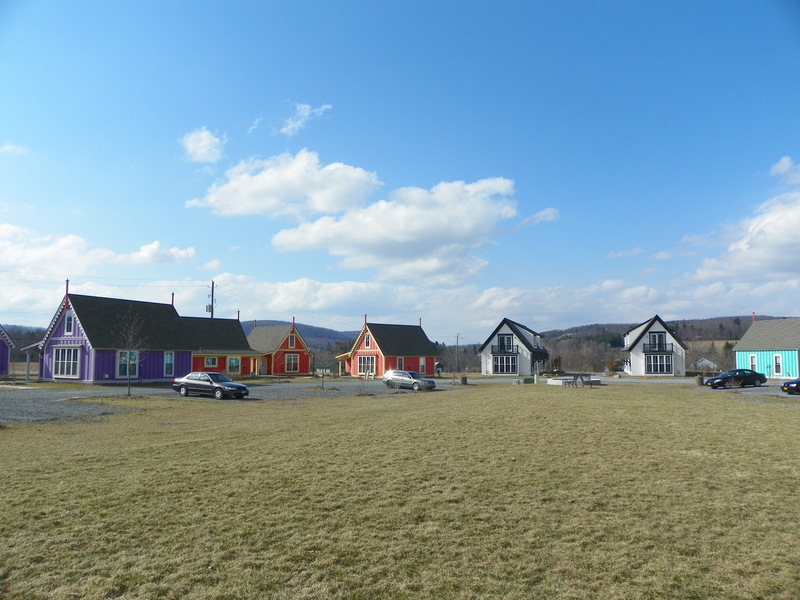 The project will add 23 more clusters and two more 3-unit buildings. Also, I realize Caroline is a bit of a stretch, but it’s only a mile detour from 79, so carpe diem. Another place that will be getting a much larger write-up eventually. 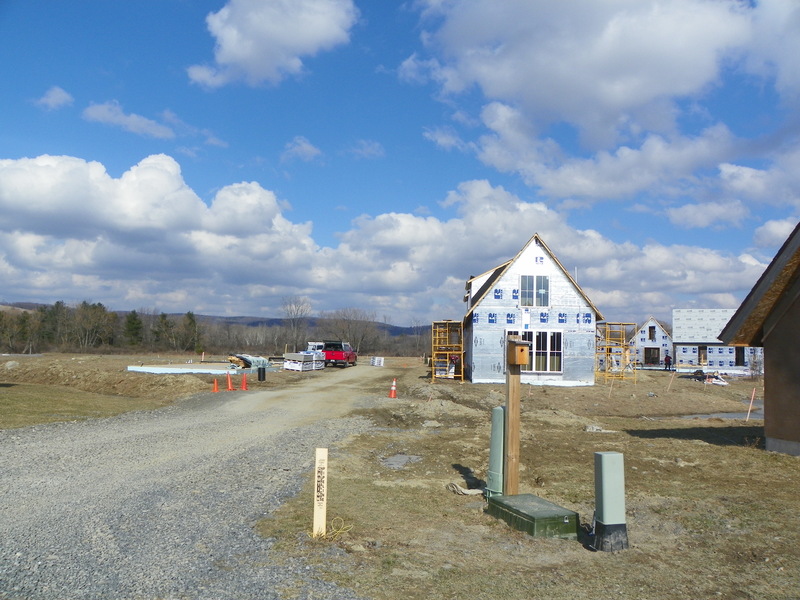 This is Ecovillage’s newest neighborhood under construction. 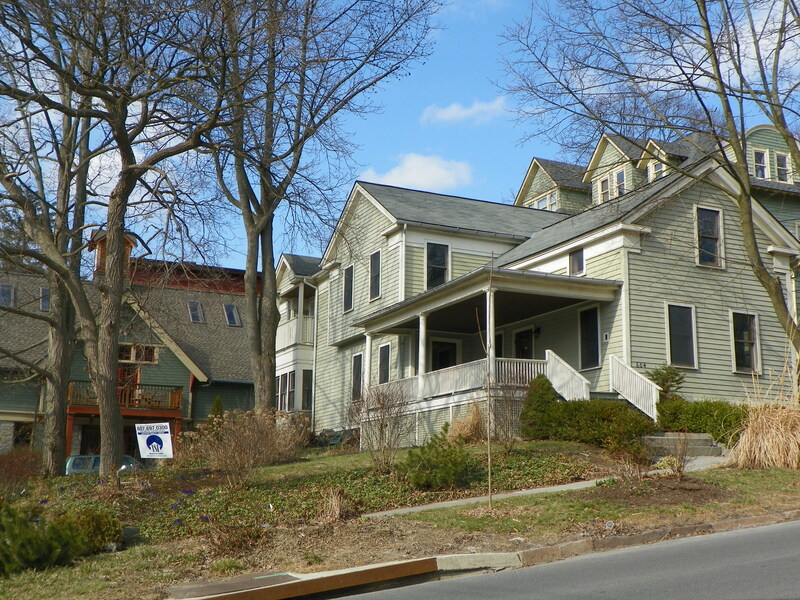 The TREE project will add 40 units, in addition to the two previous neighborhoods of 30 apiece. 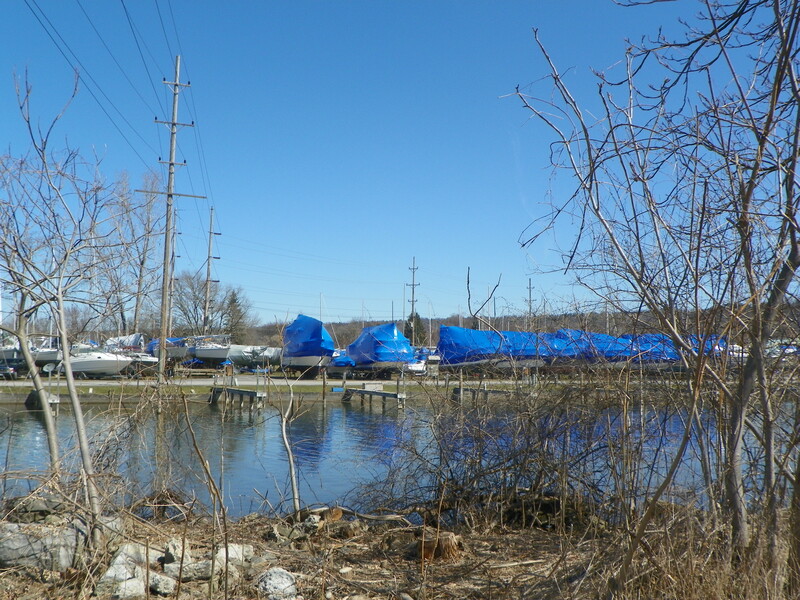 The site of Cascadilla Landing. Site Prep is supposed to be begin shortly on the 150+ unit project. 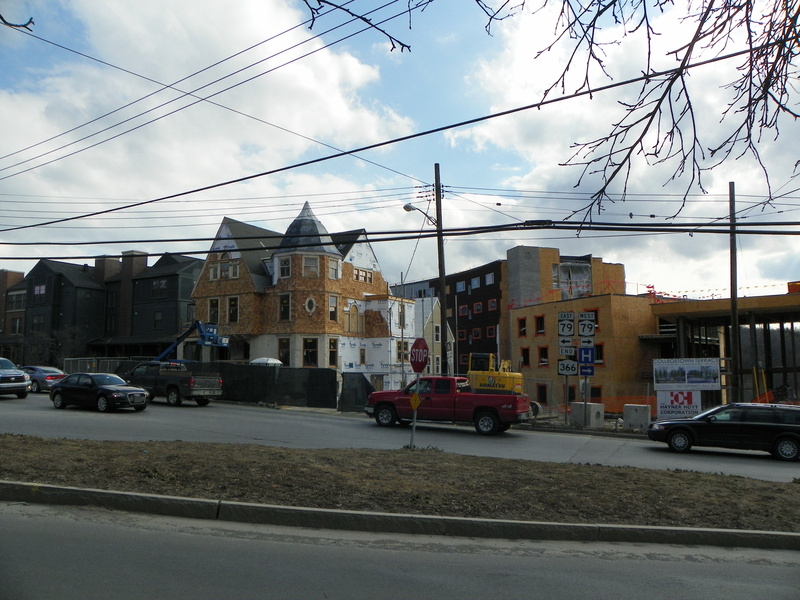 A rather unusual project, the Heritage Park Townhomes on Lincoln Street. I suppose these are supposed to be single family rentals, but I think it’s more like 3 units each. A bit ungainly and fussy, even though the detailing is appreciated. 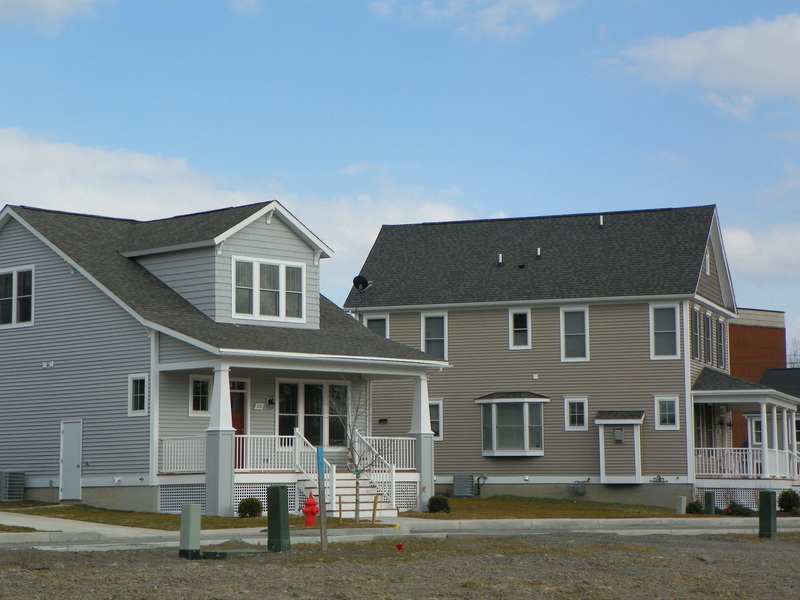 The Aurora Street pocket neighborhood, by Cosentini Construction. 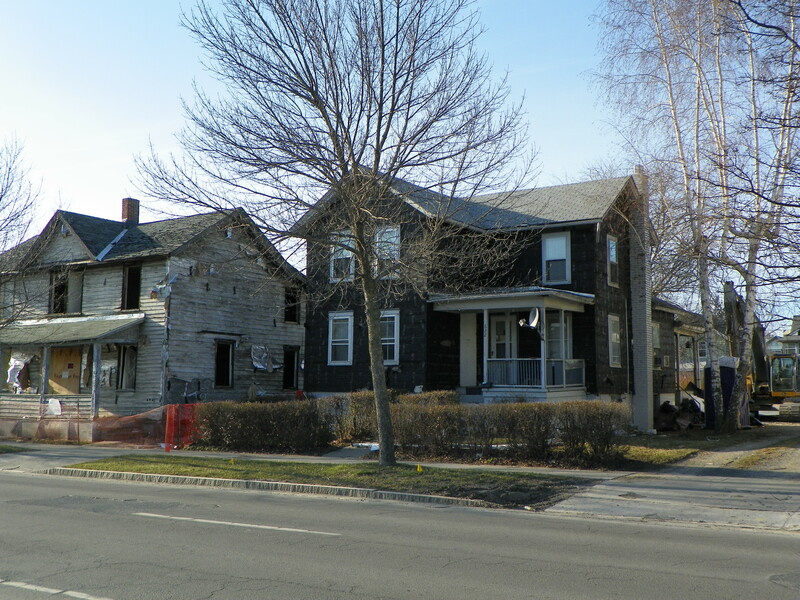 4 units, and a clever example of urban infill near the corner of Aurora and Marshall Street. The idea seems to have hit a market, as the builders are planning a second, similar development off of Lake Street. So, this threw me for a loop. 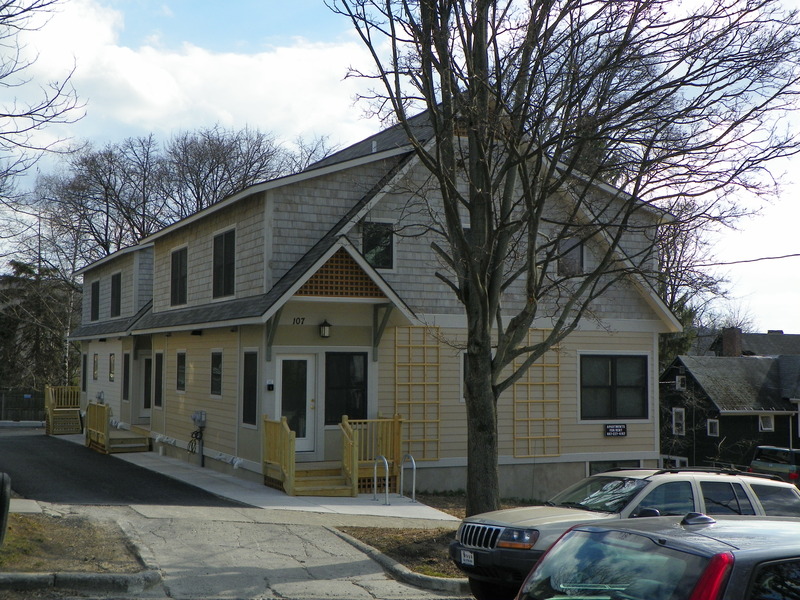 The project is Magnolia House, a 14-unit shelter/home for homeless women, under the auspices of the non-profit Tompkins Community Action. 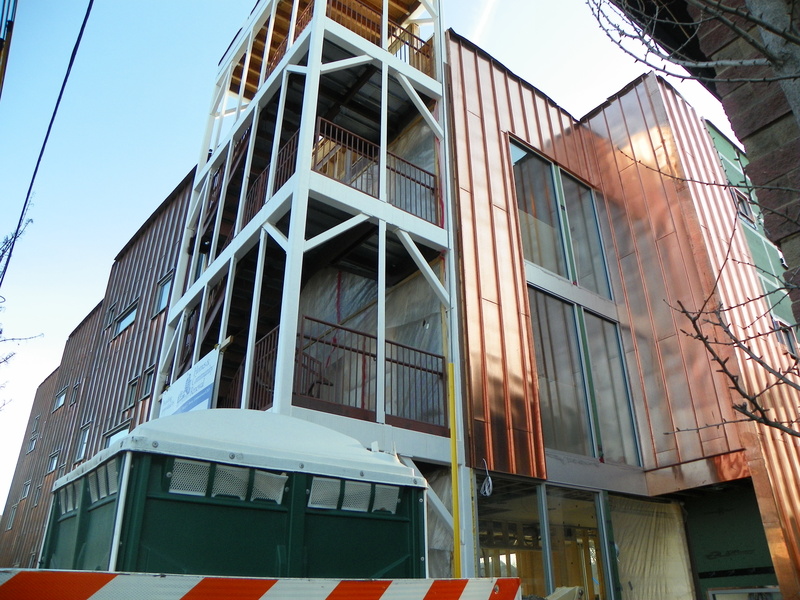 At 3/4 stories, it is one of the most visible buildings in the immediate area, with the corten steel copper plating certainly doing its part. 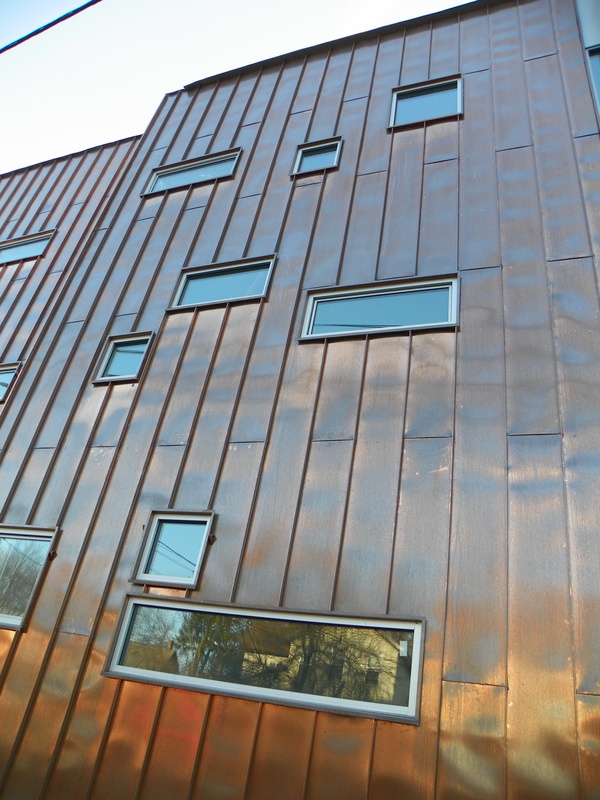 The copper is unusual, an interesting use of materials. The windows….hate. Hate, hate, hate hodgepodges. Although one day, the shelter may be overshadowed by a 5 or 6-story building with Purity on the ground floor. The project is still in the planning/approvals process, with about 20-24 units. 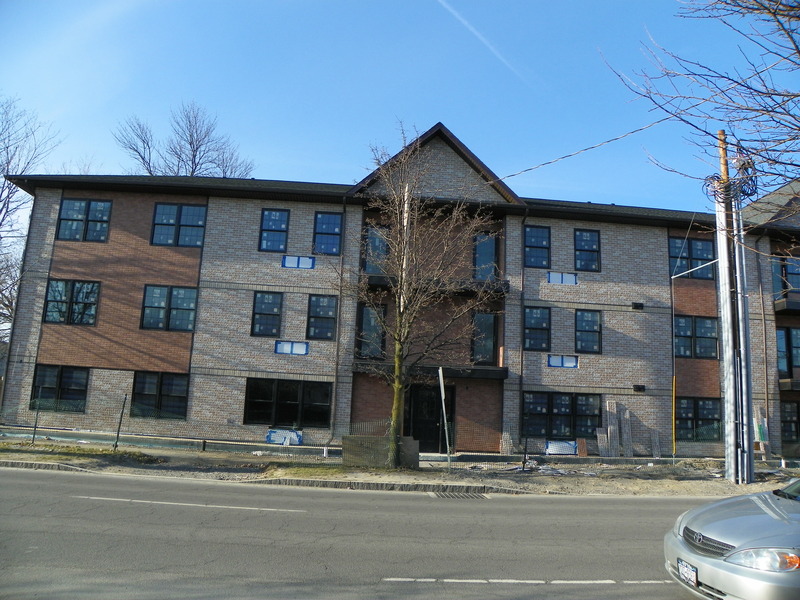 The 24-unit Iacovelli project on Seneca is near completion, with facade installation and some interior work being all that is left. …and wordpress has told me I’ve hit the limit on photos. 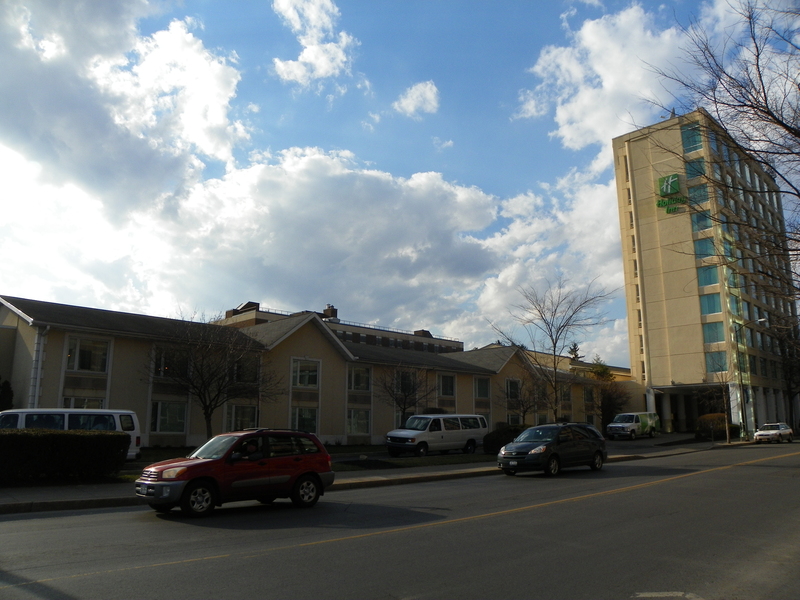 Planned Parenthood and the Fairfield Inn will be included in the next entry. 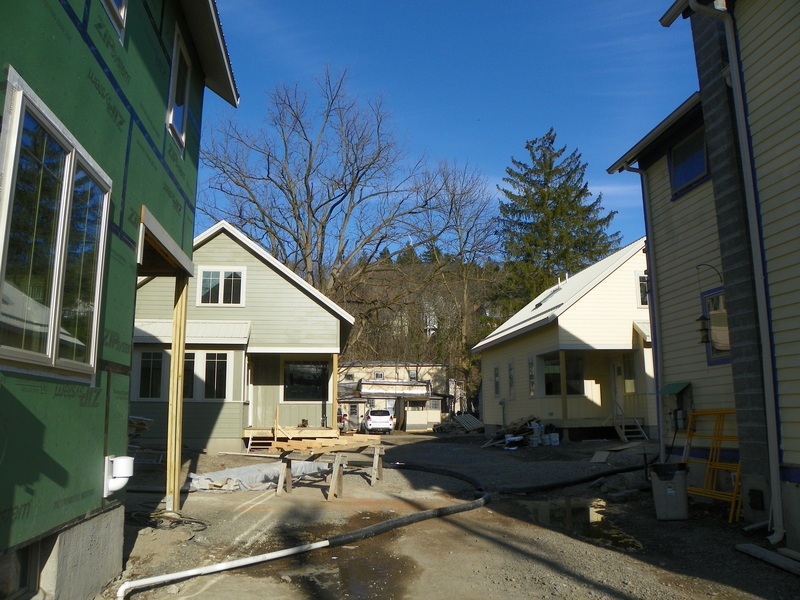 The last time I rolled through around Thanksgiving, the Vine Street Cottages projects had two homes complete and a third underway. 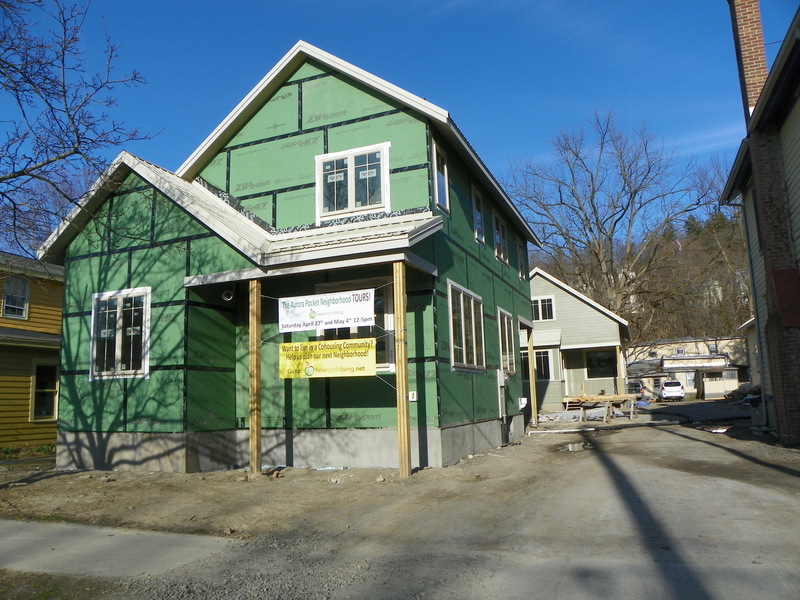 4.5 months later, and the third home is complete, but the project has shown no further development. 3 homes of 29 is not a particularly auspicious sign, especially when all of the for sale signs nearby had no “sold” stickers slapped on. They’re nice homes, but it’s not easy justifying paying $300k+ when older homes of similar design are going for 100k less five minutes away. 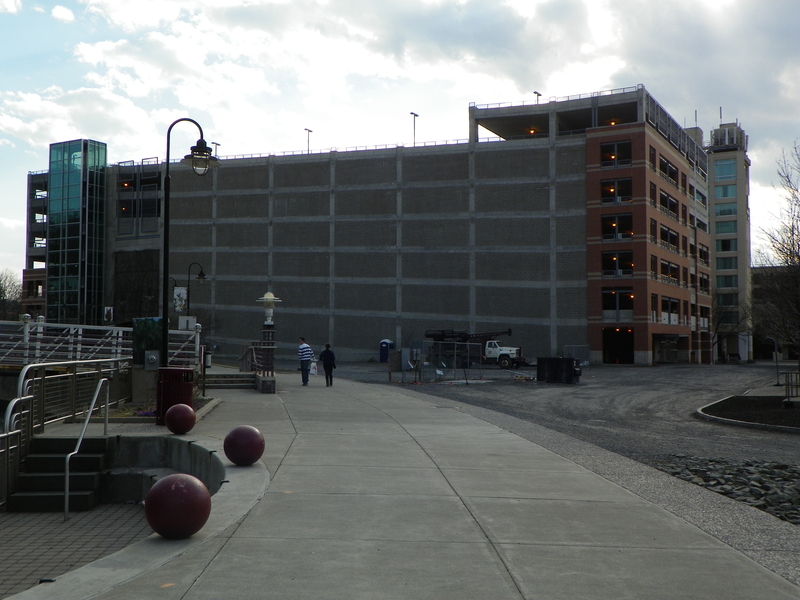 I still cannot get over how massive the Collegetown Terrace project is. 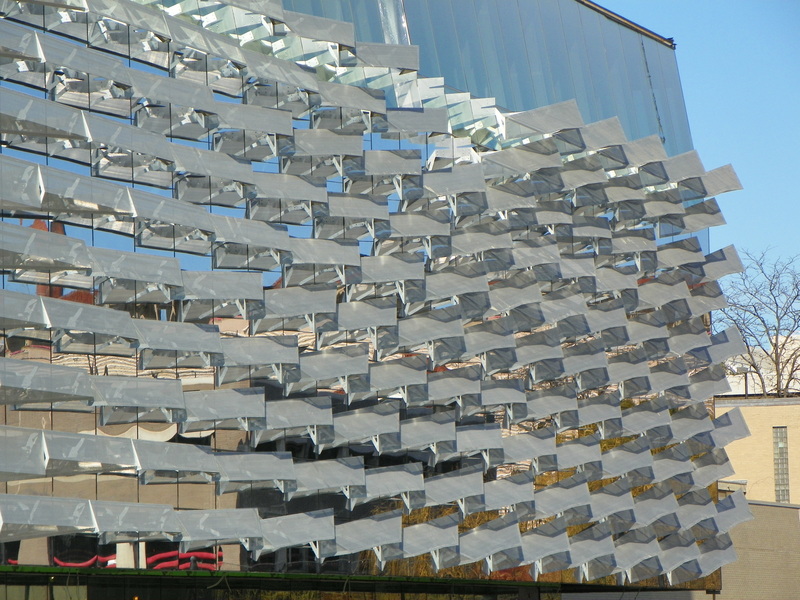 It just dominates the terminating views along the State Street corridor. The work underway at the moment is for Phase II, set to be complete this summer. 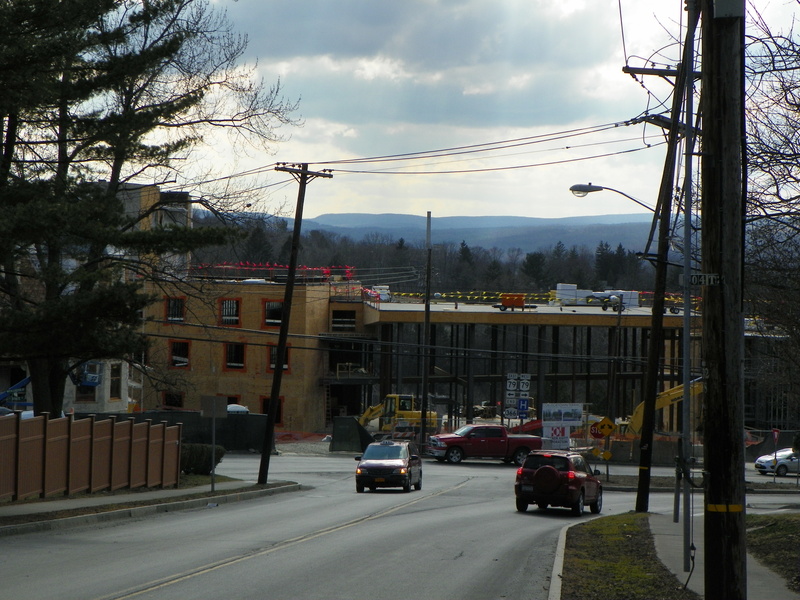 Phase III will not be as visible, as those buildings will be built closer to the gorge. One thing I did realize in taking photos was that it was extremely difficult to cross East State Street, a sentiment shared by a couple of residents who were cursing loudly while trying to cross the busy road. 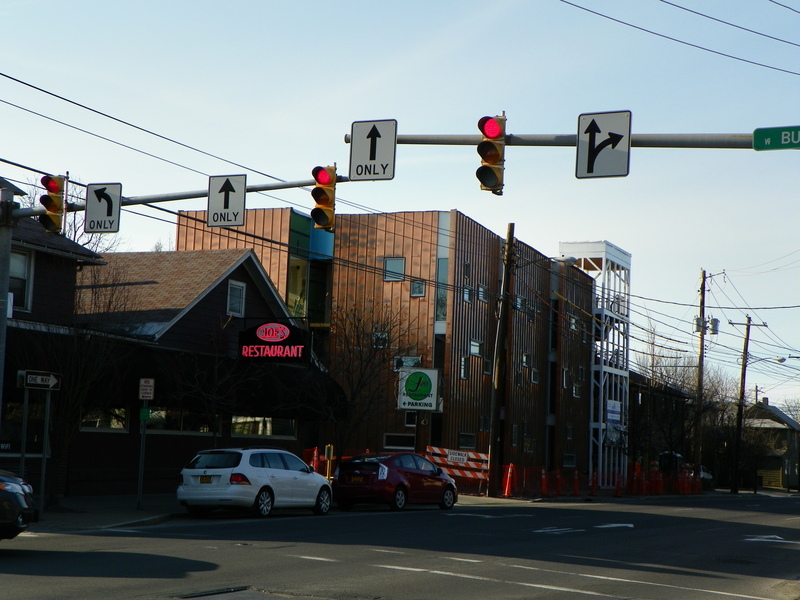 Thankfully, improvements to the road will be made to make it more pedestrian-friendly, including reworking the traffic lanes/island and adding crosswalks. The entire project will be complete in Summer 2014. Which by that time, I would not be surprised to see Novarr-Mackesey initiate plans for the former Palms property and its neighbors, all of which are owned by the development company. 107 Cook looks to be complete. 604 East Buffalo Street. 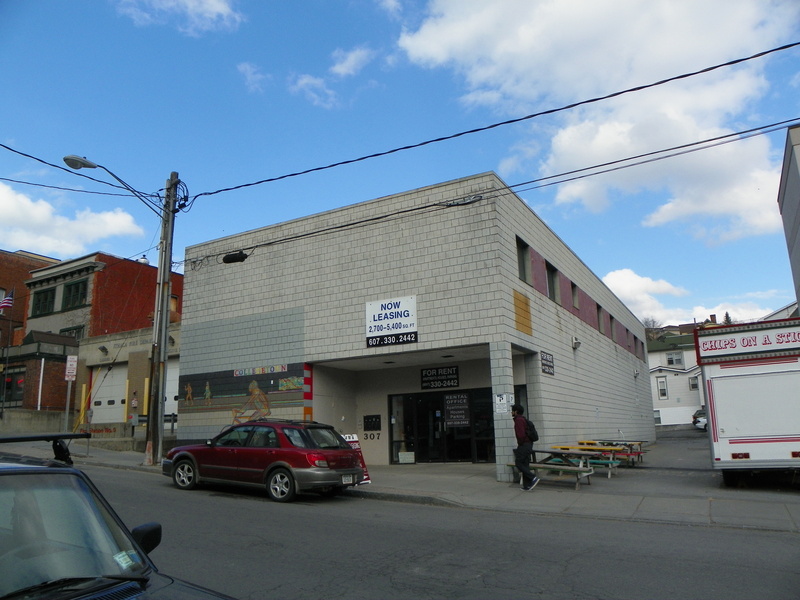 Not long ago, it was home to the Crossroads Life Center, a Christian Fellowship organization. 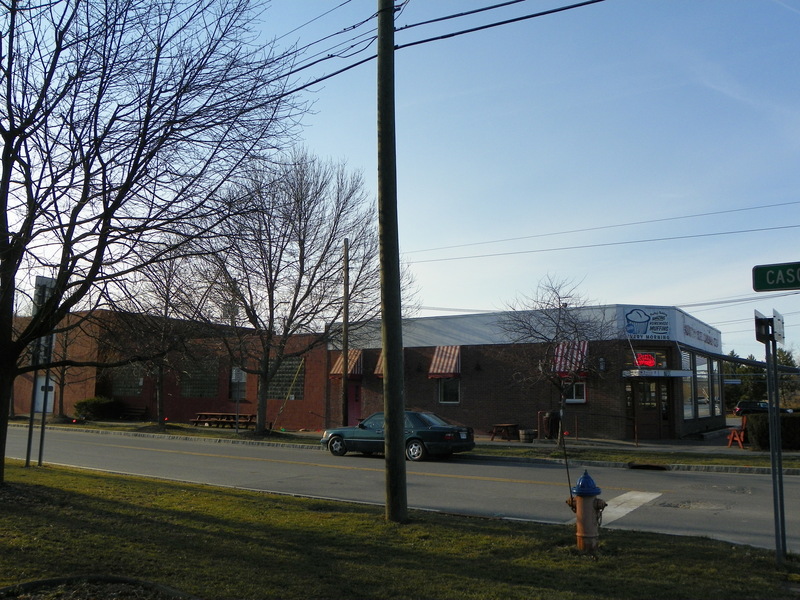 Crossroads sold the property in December 2012, anticipating a move to a newly-constructed property that appears to be in substantial need of donations in order to actually happen. 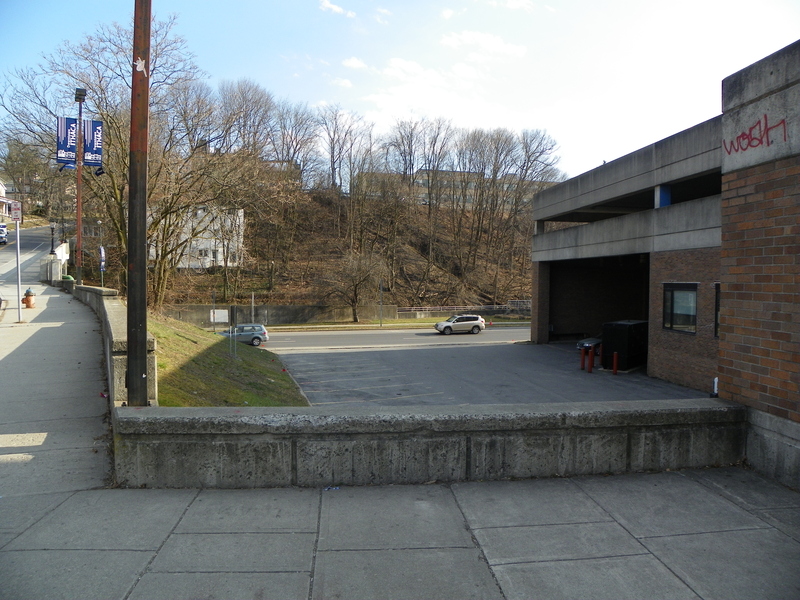 Meanwhile, WVBR bought the building for its new studio, moving out of its current digs near East Hill Plaza. In the same vein, the station is in the middle of a capital campaign to renovate the structure for their needs, to the tune of $935,000. The naming rights have been bought in full by left-wing gadfly Keith Olbermann’ 79, whose donation was partly in honor of deceased classmate Glenn Corneliess. Hence, Olbermann-Corneliess Studios. 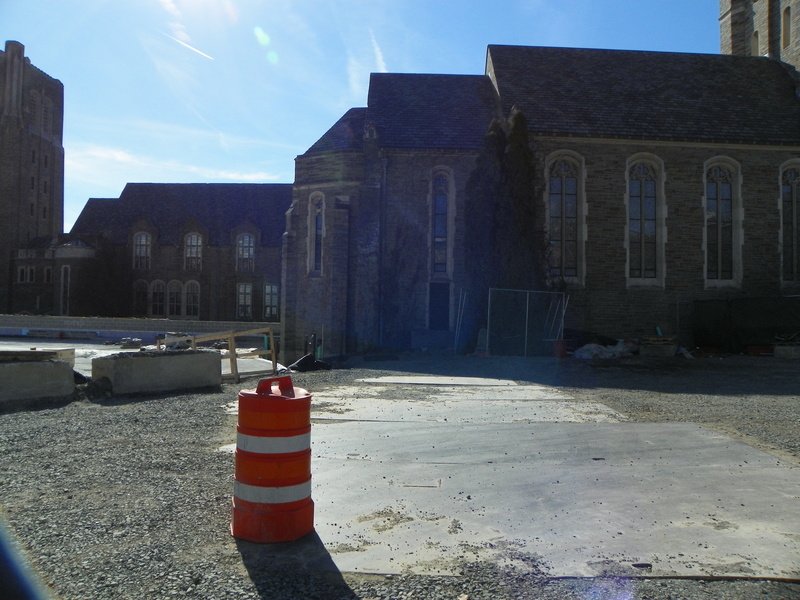 the station expects to move in by the end of fall 2013. Apparently, Pontiac 1000s still exist in the Northeast. 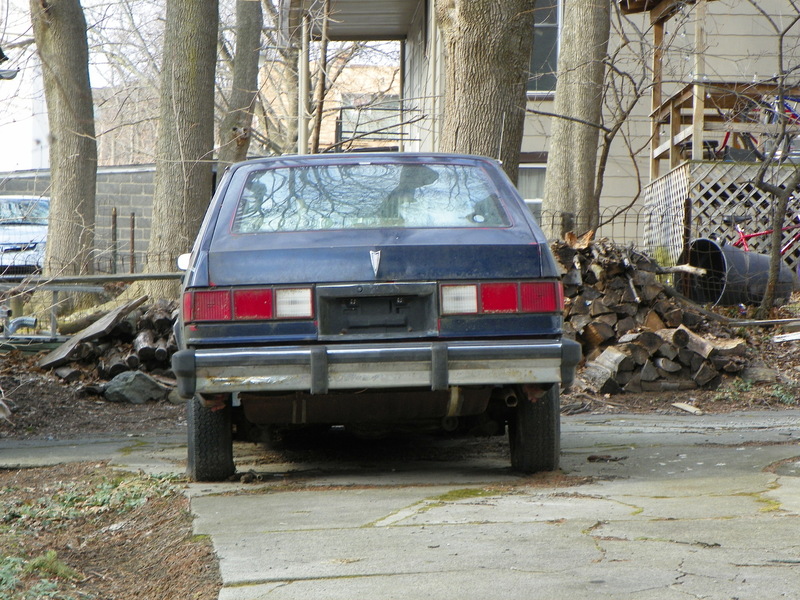 Growing up in a family with multiple mechanics, I knew as a child that owning this car, or more commonly its Chevette sibling, pretty much meant you gave up on life. Bravo to the person who’s kept one going this long, well after repairs would be worth more than the car itself. I finally had the chance to swing through Ithaca for photo updates. Casual estimate here, I spent about 4.5 hours driving around getting photos, hitting about 90% of project sites, including all in Ithaca proper. The photos will go up over the next few days, split up because wordpress freaks out when a post has a large number of images. 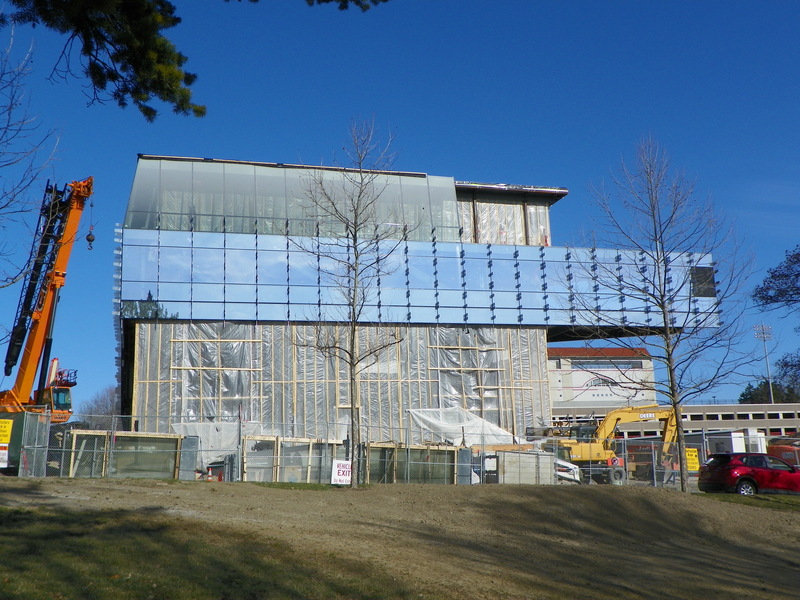 The Law School addition is well underway, though casual observers may not notice since most of the expansion is underground. 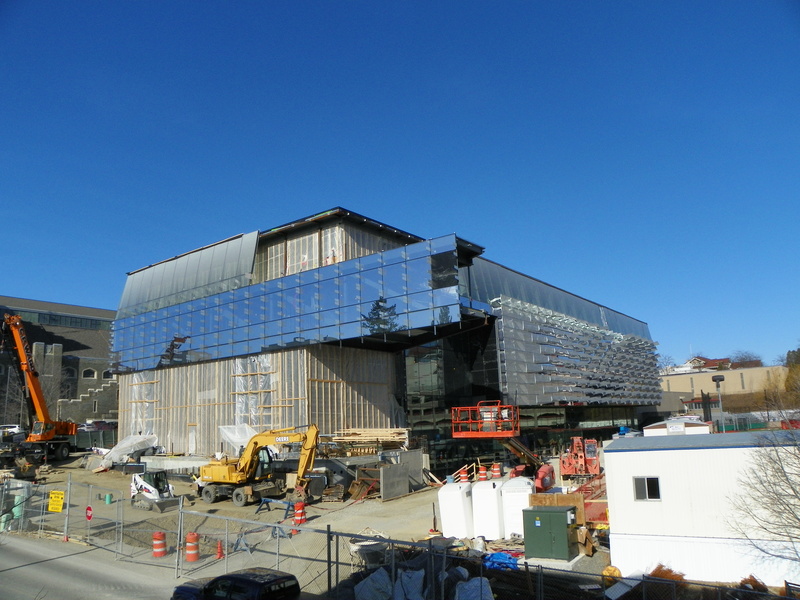 The project looks close to being on-time for the December 2013 completion of Phase I. The future home of Klarman Hall. 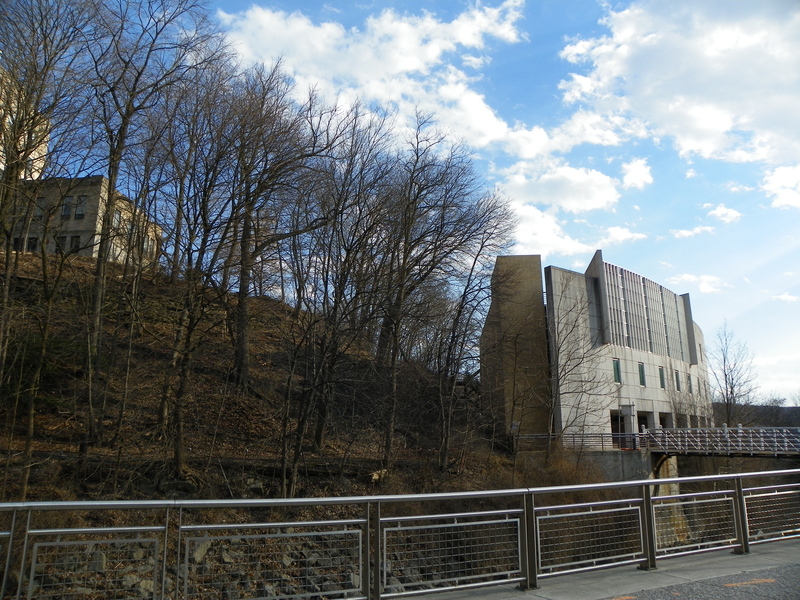 Klarman will build up the slope to an East Avenue entrance, and the small flowering trees will be no more. The rounded classroom space of Goldwin Smith will still be there, though it will be encased by the glass atrium of the new building. 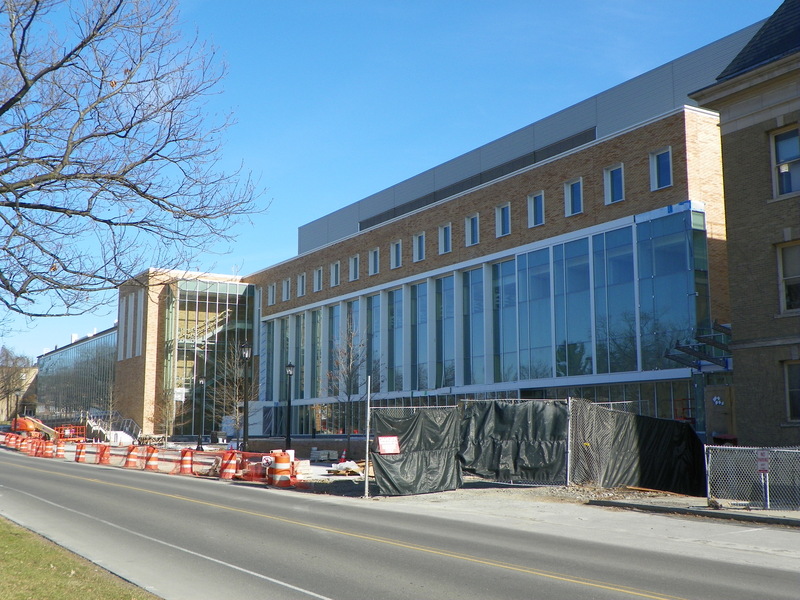 Much of the work with the Food Sciences Building has been completed, with interior work and external details underway for the addition. Phase II, the renovation of the original Stocking Hall, will begin this summer and run for about a year. I can’t help but think this looks like a gigantic Dust-Buster. 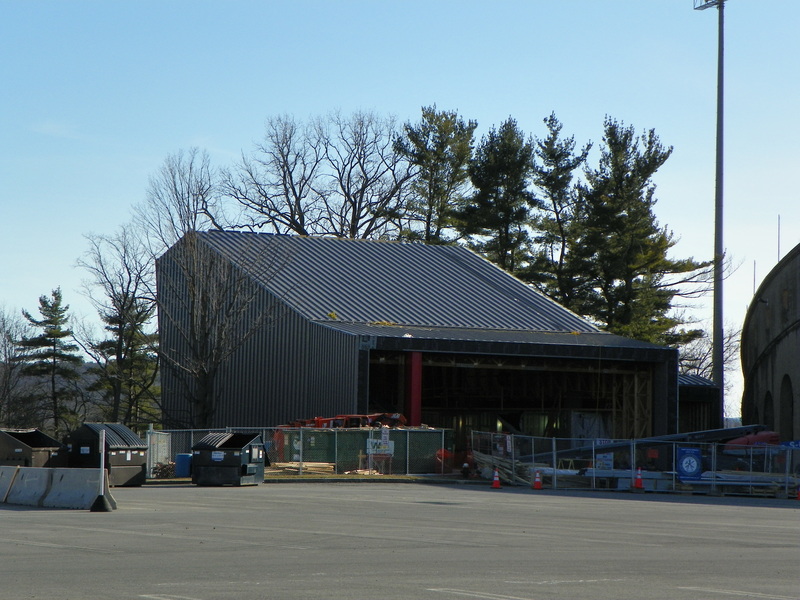 The Big Red Band’s new 4,360 sq ft building is approaching completion. I’m not quite sure how I feel about Gates Hall. The glass is high-quality, and much appreciated. However, looking at the south wall, I hope those are protective covers – to me, it just looks overly cluttered and unnecessarily “busy”. Completion of the 101,000 sq ft building is set for this December.